momstown Winnipeg: Get creative with a Dr. Seuss themed party! My daughter loves to read! And she is a little silly, as most 3 year olds are. So I wanted to throw a fun, wacky birthday party for her. So with the help of pinterest I got some fabulous ideas on a Dr. Seuss themed birthday party. 1) First off, location. I knew right away the place to have it. The Children's Museum is a fun, wacky and colourful place. 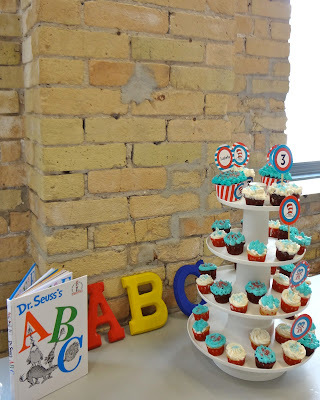 Perfect for a Dr. Seuss themed party! 2) Invitations. Well I sort of delayed myself on this, so I sent out e-invites to avoid postal delays. Otherwise I would have gone with a mailed invitation. Something about receiving an invitation in the mail that still excited me! 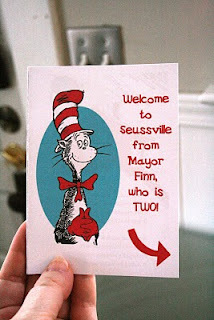 Here's a great example of a Dr. Seuss invitation, that looks like a book. Click here to see more of this invitation. 3) Guest list. This really depends on how big or small you want to go. I really am a big believer of to each their own. Some people like big parties, some like small gatherings. Last year we skipped my daughter's birthday because we just moved back home to Winnipeg. So mama guilt got the best of me and I went BIG! These were just some of the guests! 4) The food. This part was fun to get my creative juices flowing. It's easier and a lot simpler then it appears. All the ideas are all ready out there. Creative names and presentation make simple food look like hours of work. Here's a great blog that inspired me. The spread! It's all in the presentation. So simple. I worded the food on Dr. Seuss labels based on characters or objects from Dr. Seuss books. Like a Cheese Tree, Sam I Am Hamwiches, Yertles Blueberries and Green Eggs. I bought the water bottle labels off etsy. I made my own cupcakes. You can't tell but the blue icing is standing up like the hair of Thing 1 and Thing 2.
Who Pudding and Blue Goo! Pudding and Jello. Simple and easy to make. 5) The activities. The kids got to make and wear Dr. Seuss hats. They also made goo, an activity that the museum provides. But if you host this at home I would get the kids to make Oobleck! Then benefit of having a party outside the home in places such as the Children's Museum is that the kids got to run around and play in the museum. So less activities for mom to plan! Other activities you could do is pin the egg on the ham, read a Dr. Seuss book, make a wacky Dr. Seuss inspired craft or set up the inflatable pool and place cut outs of fish and have the kids fish with a fishing rod. We did a lot of these activities at our momstown Dr. Seuss Birthday Party! 6) The decorations. I actually had a hard time finding Dr. Seuss decorations at the store so I had to be creative. I bought cheap wooden A, B, C letters at Walmart and painted them. I found some cute stuff of etsy too. I printed some Dr. Seuss quotes that I bought off etsy and placed them in cheap black frames I got from Dollerama. And I placed all our Dr. Seuss books around the room as part of the decorations. I used colourful bowls for the food and that was pretty much it. 7) The loot bags. I wanted to give something useful, so they each got a Dr. Seuss book with some stickers. A few older kids got book markers instead as I figured Dr. Seuss would be a tad too easy for their reading level. So that's our Dr. Seuss Party. The only regret was I didn't take more photos. It was a fun party to plan and my daughter talked about it for weeks! Fun party! Love the cupcakes! Love the decorations - great job on the party! My kids bdays are in January and March and I already have so many ideas! Super great idea!!!!!!! !Good for you for succeeding at this, as it must have been pretty time and energy consuming..WOW. Superfantasically cool!! !